EQuIS Enterprise EDP 5 would automatically send EDD accept/reject notices to users subscribed to the facility where data were loaded (in addition to the data submitter). EQuIS Enterprise 6 provides more flexible permissions and preferences for each user. As such, Enterprise EDP will no longer automatically send EDD accept/reject notices to subscribed users/project managers. Instead, users with proper permissions may use the new EDP Status Report to view the status of EDDs. 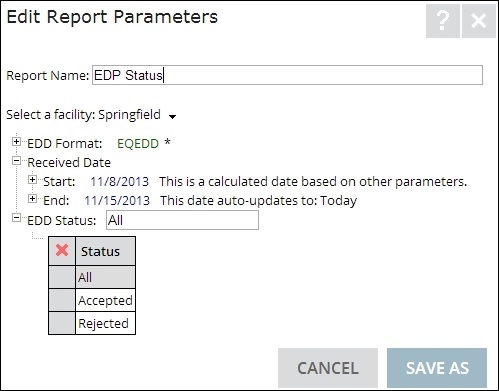 Using the EZView Widget, users may schedule the EDP Status Report as an EIA to receive the status report as often as desired (daily, weekly, etc). Publish the report (EarthSoft.Reports.Library.90611.dll) to your EQuIS database before using the report in EQuIS Enterprise. The EarthSoft.Reports.Library.90611.dll is included with the standard EQuIS Professional installation (v6.3.0+). •A summary default.html document that shows all notices, including links to the commit and/or error logs mentioned previously. Note that the *.zip must be extracted for the links to work properly.